It’s been a cold winter in the UK – everyone seems getting flu including this girl who has just moved here from California. I’ve been shooting outside a lot for the last couple of months and although I’m fairly used to the cold as I’m originally from the north of Japan, I now have chilblains all over my feet and they started spreading to my hands too – I think it’s time for me to get some serious shoes, socks and gloves! Between those shoots, I was doing some Christmas shopping at this small, but wonderful Italian deli called Vallebona in London – I’ve been fortunate to work with them since last year and it’s been a pleasure to get to know them personally too. It is run by Stefano Vallebona, who is originally from Sardinia, and his Japanese wife Naoko – they import specialised artisan products from Italy and supply many of the top London restaurants as well as selling some of them online. They don’t have a ‘shop’ as such but they have weekly tasting events at their warehouse. I strongly recommend visiting there if you are near Wimbledon – they offer generous samples and I can assure you that you can’t leave there empty-handed, their cheeses and charcuterie selections are especially excellent. I remembered the Giorgio Locatelli book had a recipe for truffle honey ice cream – it’s a fantastic (and huge) book by the way, reading it through makes you wish you were born as Italian :) An inspiration came from this super talented girl as usual – I was instantly sold by the idea of pairing it with hazelnuts. As Joycelyn wrote, the Locatelli book is very precise in order to preserve the original restaurant quality of the recipes. I appreciate his approach and I will look forward to trying it out sometime – but for now, I’ve adapted the recipe to more suit a home kitchen. I couldn’t help adding a twist on my honey madeleines also. My favourite madeleine recipe comes from Claire Clark’s Indulge – I’ve tried some elaborate recipes from her book but so far I find I like her simple recipes like shortbread or scones better. The madeleines are delicious on their own, but again, it’s also lovely to add some orange zest and hazelnuts (chopped or ground). Place the milk and sugar in a saucepan and bring to a simmer. In a bowl, whisk the egg yolks. Pour the warm milk into the yolks, stirring constantly – then mix both types of honey in. Place the mixture back in the saucepan and put on a medium heat, constantly stirring with a wooden spoon until the custard thickens and coats the back of the spoon. Strain into a clean bowl, cool over ice-cold water and chill in the fridge. Add the double cream and churn the custard in an ice-cream machine according to the manufacturer’s instructions. Preheat the oven to 130ºC. Sieve both the nuts and the icing sugar into a bowl and lightly mix. Whisk the egg whites in an electric mixer until they form soft peaks. Add the caster sugar a little at a time whisking as you go; continue whisking until glossy, then gently fold the nuts and sugar mixture. Using a spatula, spread the mixture onto a baking parchment-lined oven tray, about 7-8mm thick. Level the surface and bake in the preheated oven for about 1 hour or until the meringue feels dry. Turn off the oven and leave to cool in the oven. Preheat the oven to 170ºC and butter your chosen mould. Place the eggs and sugar in a bowl and whisk until it falls in ribbons (It will help greatly if you have an electric mixer). Gently fold the nuts, orange zest and juice into the batter and pour into the mould and bake for about 20-25 minutes, until golden – a skewer inserted in the centre should come out clean. Leave to cool on a wire rack. To make the syrup, place the orange juice, zest and sugar in a saucepan, simmer until slightly syrupy. Cool a little and brush over the warm cake. You can serve in any way, but I’ve sandwiched the sponge in the dacquoise and sprinkled over some pralined hazelnuts (coat toasted nuts in hot caramel then chop roughly when cool), but plain toasted nuts work fine too. Decorate with some gold leaf and dust some icing sugar on top if you fancy. Preheat the oven to 200ºC. Brush the moulds with the melted butter. Sift the flour and baking powder together in a bowl. Melt the 90g butter and honey in a small pan and cool slightly. In a mixing bowl, place the eggs, both the sugars and the salt. Whisk until pale and nearly tripled in volume, the batter should fall in ribbons. Sift the flour and baking powder mixture into the batter and fold gently; then pour in the cooled melted butter and honey, down the side of the bowl (rather than directly on top of the batter) and gently mix. Cover and rest in the fridge for about an hour. Spoon the batter into the moulds, it will spread during baking so fill each mould about 2/3 full. Bake for 5-10 minutes depending on your mould size. Take out from the moulds straight after baking. Cool on a wire rack. Hi Keiko, glad that this post come with the recipe too. I don’t have Gorgio Locatelli book, but tempted to buy it. I do too like Claire Clark, and tried some of her recipe, but not the madeleines. Oh by the way, I made poached pear the last week, and steal your idea of browning the pear wiht blow torch. It really give the poached pear different look. More beautiful, I must say. I’m planning to make your Gateau Weekend soon. mmmm truffle honey sounds very decadent, and the pictures are as gorgeous as ever. do wrap up well when you go out (i started getting chilblains too and started wearing my gloves and thick socks since, and they’re gone now) and wishing you a very happy new year. I was just up in Napa and paid Bouchon Bakery a visit. The line was out the door – Claire’s popular shortbread was long gone by the time I got up to the counter but other treats were just as yummy! Wonderful Keiko. I have the George Locotelli book but have yet to cook any of the recipes. I do use it for inspiration though. Great to see your beautiful creations again. They all look absolutely delicious! I love madeleine, and I would love to try this if I can find truffle honey. Stay warm! What a lovely sweets & photos as always! I have never tried truffle honey before! You always inspire me! Sometimes soon, I like to try your recipe :-) Thank you very much. Your blog and photographs are really, really beautiful. I was wondering, have you changed cameras since you first started this blog? Are you still using a Minolta? Again, your pictures are really amazing, its hard to believe you only started three years ago! I found your website when David Lebovitz posted it in Facebook. I really love your photographs – they are gorgeous. I agree with Murasaki – great heads-up from David Lebovitz. Fantastic photos as usual. Just such a lovely quality of light – the shots look effortless and beautiful. Truffle oil is great isn’t it? I love it on roasted beets, with a sprinkle of salt. Hi Keiko, thanks for posting such beautiful photos! they’re really an inspiration to me and I hope to one day be able to shoot as beautifully as you do. =D stay warm! Your photos are beautiful as always. I’ve never had madeleines but yours look scrumptious – I think I might try that recipe. 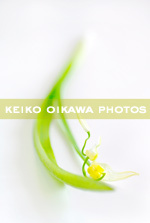 Hi Keiko – I’ve just found your blog and love your posts and pictures. I’m a California transplant in London and so very much understand your gripes about the weather. Thanks for the Vallebona tip – I’m going to try and get out to Wimbeldon for one of their Saturday tastings in the next few weeks! I am looking for molds of madeleines now. I decided to buy this type of molds, not silicon type. Ii shashin!! And thank you for the recipes. the photos are gorgeous. and the madeleines look extra yummy!! 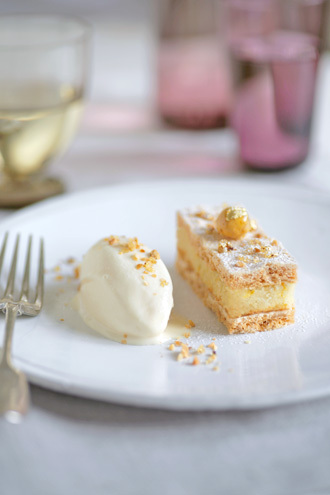 Beautiful photos as usual and the recipes sound delicious. I’m getting tempted by a trip south west to visit Vallebona now. Great photos! Love the vintage madeleine pan. Where did you get it? great photos! may i know which camera model are you using? dearest keiko, what an utterly brilliant composition! – i mean both the flavours (truffle+hazel+citrus) and the pictures, of course! your description and exquisite pictures allow me to almost taste your wonderful creation right off the page…and looking at those lovely madeleines made me re-visit your gorgeous “gateau weekend” from ages ago…isn’t it incredible how quickly time flies? How are you dear friend?? Here in Turin still cold, so cold! I love your photos, so poetic and brilliant. Hi Keiko san. Your website is very beautiful. Great recipes, wonderful photos. I know you love Truffle Oil and Truffle Honey, but do you realise that all the flavour in these products comes from a chemical called 2,4 dithiapentane, not from truffles ? If you want to know more, please drop me an email. You have such a beautiful space here. Such gorgeous photos and wonderful recipes. The truffle honey ice cream sounds amazing! Cheers! Wow – despite the cold winter temperatures, you’re inspiring me to get out my icecream maker again! Looks incredible. Am a huge fan of Locatelli too (the book and the restaurant). Gotta watch out with some of his ingredients list though – there are a few editorial mistakes that could really mess up a recipe! Look how sweet you are! As lovely as the Prange Blossom honey I’ve been using to make some delightful treats in North London. Keiko, this is why I always look forward to your visually wonderful posts!! I can’t stop looking at your photos!! And where did you get the madeleine pans from? I absolutely need something like that to splurge on!! They are divine! I hope to read more posts from you this year! Truffle Honey Sounds great, I haven’t heard of it before. The madeleines look fantastic, a nice combination all across the board! What a wonderful idea – like you, I love truffle honey but have never thought of cooking with it! Beautiful pictures, as always. Hello Keiko, stay away from that flu; I had it last year and will be getting a flu shot from now on. Your photos are again quite inspiring and recipes also. 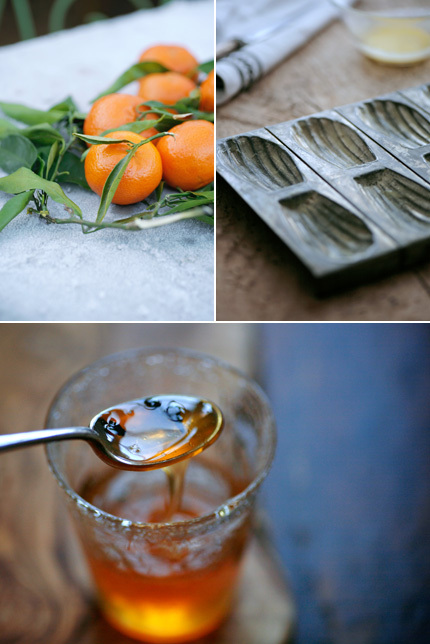 I am a big fan of honey…it is so elemental and of course one of mankind’s very first foods. I love the simplicity of it, it is truly a gift of the gods. Thank you again for your wonderful posts they are always a ray of sunshine no matter what the season. Your photos always come out so beautifully. They’re something I aim for with my own photography. I really should get outside more but the lack of outside space in my London flat and north west facing windows leave me taking lots of artificial light shots instead. Wonderful shots and beautiful colour, I love it. Lovely madeleines too. They look like having a nice chat on the metal tray. Cute. I’ll stay here, as a silent and steady reader! 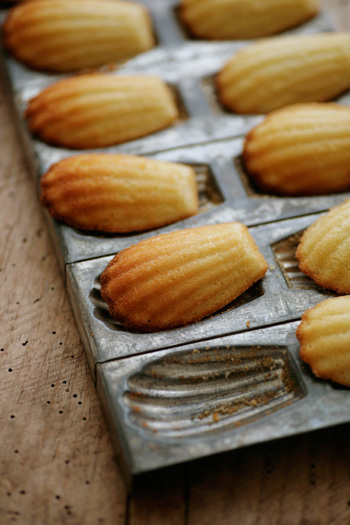 madeleines…. oh I love them where is my early grey tea.. Your Madeleines creation is absolutely lovely and I Bet it tastes like little cakes from heaven! Fantastic photos! Great recipe for my next party. This site can make bad days a little better. Can I please have some truffle honey ice cream right now? Tell me I CAN! I know it is only 11:00 in the morning!! Yummy! Hello, I would just like to inform U, that I published a link to Ur blog among favourities;) Thank U for lovely climate&inspirations! What a lovely gift your blog is Keiko, thank you. And I must try the madelaines, I have the tray but have not made them yet. You have inspired me. I’ve just stumbled across your site – and very happy I did! I have just been given a madeleine recipe – and so I’m looking for some pans…........, and on seeing yours I would love some vintage ones. So I was wondering where you got the ones that are used in your photographs? i too wonder what ms. Vicki wonders ! Thanks for the info on the truffle honey! I’ve been searching for something like that since arriving in London to make truffle honey ganache for chocolate bonbons. They taste great but need a good truffle honey that does not smell like kerosene. These madelelines look amazing! They are making me hungry. And anything with truffle, well, delicious! Absolutely beautiful photos, as always. Your shots are continually an inspiration for us. I can’t wait to try this recipe. Madeleines have always been my favorite little cookie, especially with an afternoon espresso, but I’ve yet to find that “perfect recipe.” This may very well be it. Thanks for sharing your talent and the recipes. Todd. Another set of beautiful photos as always. You are such an inspiration to us in the food blogging world! I just came across your website after doing a search for “tea cake recipes” and I’m amazed by the pictures and layout. What a wonderful job you have done on your webpage. The photos are absolutely captivating. Keep up the great work. It’s the truffle honey madeleines that got me. It is pouring out and I just got back from culinary school where I spend the day fabricating chickens. 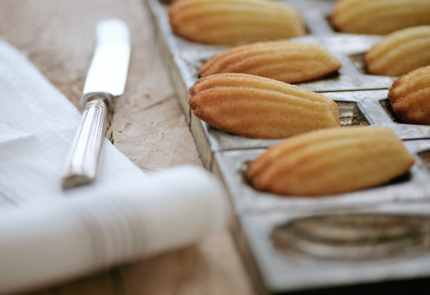 And those madeleines with a strong cup of tea sound like a slice of heaven right about now. I was wondering where you got the vintage pans or had any suggestions. Thank you for sharing your wonderful blog. I love madeleines and inherited 2 beautiful moulds from my mother-in-law. I’d been thinking of making madeleines for sometime since she passed away 10 years ago. It’s a pity I never have the chance to taste her madeleines as she’s a very good baker & managed to teach me few recipes… 1 month before her dismissed. I must try out some madeleine recettes soon! Thank you for ‘shaking’ up my memories :-D As usual your photos and write-ups always inspiration to me. Hi everyone, thank you so much for all your kind notes and I’m sorry I didn’t get back to you sooner. Yuting – I have changed indeed :) I had a Canon 350D for 2 years, then now use a 5D. Pat – your madeleines look lovely! Yukko-san – the metal ones are definitely better than silicon ones, hope you’ll find one you like! Cherie, Christy, Vicki, Corrin, anonymous – I got the mould at a lovely little shop called Mamie Gateaux in Paris (on rue du Cherche-Midi) – it’s run by a French and Japanese couple and they have a cafe next door too. Viona – I use a Canon 5D. Nat, Sandra – lots of love to your kitties too! Emily – I’ve noticed that some of the recipes are not detailed enough too! Joshua – I understand how difficult it could be to take shots with natural light in the UK especially in winter – using a tripod & remote should help though. I love your website. Your madeleines are super cute and sound so delicious! My old boss makes them and every now and again I pop in to see him and pick up a delicious box of them. Where can you buy the truffle honey? I live down the end of the world in little ‘ol NZ, is there an online retailer? I have always wanted to learn how to make madelines and French macaroons. Thanks!